Oscar Torres is now 80 years old and yet his memories of Neighborhood House are as clear as if they had happened yesterday. He credits Neighborhood House for being the “baby sitter” for him and his brothers and sisters. Both of his parents worked and Neighborhood House provided a place to spend the day in a safe environment. Most non-school days he played at Neighborhood House from 8:00 in the morning until 9:00 at night. They would go home and eat dinner and return to continue playing outside until Neighborhood House closed. Like other boys his same age, playing board games, baseball and basketball and the field trips stand out his memory. Oscar still has the letters he earned at Neighborhood House playing football, baseball and basketball. Oscar says they invented the first slip-and-slide at Neighborhood House. This was accomplished using the shower. The shower had a rim a few inches high around it. They figured out that by placing towels over the drain, a pool of water several inches high would form. They would then take a running start and slip and slide all over the shower. Another thing that made the shower unique and no doubt made it a popular place to shower is that Neighborhood House had hot showers. 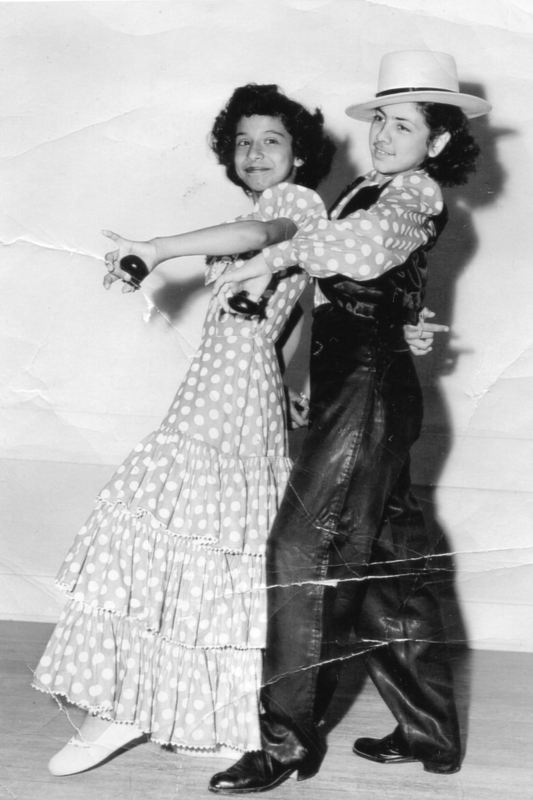 Rosita, along with her two sisters, took dance lessons from Albert Flores at Neighborhood House. They learned the traditional Mexican dances, “Las Chiapanecas” and “El Jarabe.” She remembers performing at different places throughout the city. She cannot remember the exact locations of their performances, but knows they danced at the Balboa Park Organ Pavilion at least once. She also learned to dance using the castanets. Rosita also remembers taking a recipe home and then the next day bringing those ingredients (e.g. salt/lard) or whatever else you needed to bake the dish. Neighborhood House supplied the flour and you brought the other items. Rosita remembers taking the baked item home for the family to enjoy; however Oscar remembers that he would eat the cookies on the way home, thus his culinary accomplishment never made it home. Like most of the girls in the neighborhood, she would go to Neighborhood House for a specific class and then return home. Girls did not “hang out” at Neighborhood House. Their parents did not allow them to remain at Neighborhood House without a specific reason. Like other men I interviewed, Oscar remembers playing the belt game. There was a carport-like structure behind the Neighborhood House known as The Shack. The Shack was considered the safe zone. Someone would find a belt but did not say a word about being in possession of the belt. Once he, the person that had possession of the belt, got near the other boys he started hitting them with the belt until they reached the safe zone—The Shack. Mickey taught the boys how to surf and took them to the beach. Oscar remembers the older boys making surf boards in the wood shop class. So much for the myth that Mexicans don’t surf. At times one of the players would slip and fall. Sometimes the poor person that fell would trip other players and you would end up with a pile of boys being hit by the belt. Fernando Garcia remembers playing the belt game in the 50’s, thus this game was played and was very popular with several generations. Oscar laughs as he remembers how if you were in trouble and your parents hit you with the belt, you cried immediately; however you could play the belt game and never shed a tear. There was an intern coach named Mickey that came from San Diego State College. “When he first got to Neighborhood House we were sitting on the steps and started to give him the business because he was Anglo. He could hold his own and put several of us in a head lock.” Mickey taught the boys how to surf and took them to the beach. Oscar remembers the older boys making surf boards in the wood shop class. So much for the myth that Mexicans don’t surf. Oscar makes it very clear that he considers Coach Pinkerton “the best.” He says that tennis was not played until Coach Pinkerton came to Neighborhood House. The tennis games will be discussed when I write about my interview with Ruben and Mark Carriedo. Oscar has a lot of memories about Tortilla’s Army, which will be the subject of a future article. Tortilla was Manuel Ojeda, the uncle of Connie Ojeda Hernandez. Oscar remembers that Tortilla was very dramatic. They would go to the movies and then the club (Tortilla’s Army) would enact the movie they had seen. He’s unsure why the boys all followed Tortilla but they did. At various times they produced Custer’s Last Stand, any war movie they had seen on the big screen or sometimes children’s plays. The plays were usually performed on the playground behind the Neighborhood House. Once when Tortilla was pretending to be Zorro he chased another boy with a real knife. The guy suddenly stopped and was accidentally stabbed by the knife. On another occasion, they were performing a play about the Mounted Police. Patty Boy (Laura Rodriguez’ son David) took his sister Norma’s red coat to use as a prop for one of the plays. He tied the coat around his waist and proclaimed himself a Mounted Police. These kids had many wonderful times growing up in Logan Heights and attending Neighborhood House. Oscar remembers that a Mrs. Mauser took “good care of us.” She taught them how to play board games, including “Sorry.” The fondness Oscar has for Neighborhood House can be heard not only in the words he says but in the tone of his voice. Previous articles in the History of Neighborhood House series here. Maria Garcia is a retired school principal and has been an activist in the Chicano movement since 1968. She is the recipient of the 2015 SOHO Cultural Heritage Award for her Neighborhood House series and was designated as one of six Women of the Year (2015) by State Senator Ben Hueso for her historical preservation of life in Logan Heights. She is an inductee in the San Diego County Women's Hall of Fame 2016. 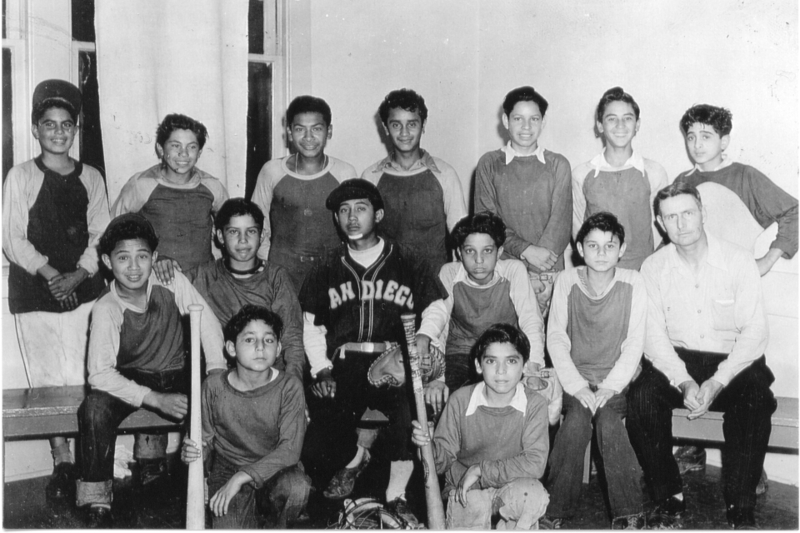 Maria is also a member of the Latino Baseball History Project Advisory Board and the San Diego City Schools Latino Advisory Board. Maria received a Society of Professional Journalists, San Diego Chapter 2016 Journalism award and hosts a weekly talk show, Vecinos on WSRadio.com. She is a recipient of the State of CA Governor's Historic Preservation Award (2017); selected as a Latino Champion by San Diego Union-Tribune (2017); Citizen of the Year Award from the San Diego Chapter of Phi Delta Kappa (2017). The San Diego City Council declared December 5, 2017 as Maria Garcia Day. Awarded Honorable Mention by the 2018 International Latino Book Awards in the category of Best History Book, English for La Neighbor: A Settlement House in Logan Heights. Nice article about the Neighborhood House Maria!! I remember going there as a preschooler. My mom enrolled me in the Head Start program in the mid-sixties. Your description of the kids’ experiences reminds me of my experiences growing up in the Barrio Station. Rachael was like a mother to many of us… scoldings included. Thanks to the Barrio Station we were introduced to organized sports, Magic Mountain, Disneyland, music concerts, public speaking, the outdoors, and this isn’t all. Places like this are important in our neighborhoods, giving kids somewhere to go and something to do. It’s great that there are so many organizations out there, serving our children and youth, giving them different areas of interest to choose from. It’s sad that public and private funding is so limited that one has to be chosen over another. your right. Everyone says they value kids but they aren’t willing to put their money where their mouth is. I can still see you as a kid at the Barrio station. Maria, thank you so much for your wonderful stories about Neighborhood House! This is another winner! I am thinking that the Marsten’s, Coach Pinkerton, Coach Mikey, Albert Flores, Mrs. Mauser and others who touched so many lives are smiling from above. So often people who work in the non-profit sector go thru life not knowing if they made a difference. Yours stories prove that in fact they made a big difference and the name “Neighborhood House” truly was exactly that. Thanks for much for your wonderful story on Oscar and Rosita. You captured their childhood joy which helped make them the terrific people they are. Adela, your welcome. Thank you for introducing me to Oscar and Rosita, two of the nicest people I have ever met. Everyone I have talked to has nothing but praise for all those people. Coach Pinkerton has been praised by every man I have interviewed. I am thinking of using every comment when I write about him. He deserves the tribute.